On Friday, I wrote about the possibility of the season’s first hurricane developing from a tropical wave that was about to emerge from the coast of Africa. At that point, two of the major global computer models, the GFS and ECMWF, were both indicating the development of the tropical wave as it approached the Lesser Antilles. Now, here we are on Monday and the GFS essentially stands alone. The ECMWF has all but completely dropped the notion of development while the GFS is about as consistent as it can be. If we follow the evidence we can try to figure out what may end up happening – while also either confirming or denying the GFS and its ability to forecast the development of a tropical storm in the deep tropics. I have prepared a video discussion covering this intriguing situation by taking a close look at not only the model forecast but also what we see in front of us right now. What does the evidence show? Is there enough there to support the idea of a tropical storm forming later this week? Check out the video below to learn more. Recent satellite shot showing invest 99L and the limited convection associated with it currently. This will allow the tropical wave to move farther to the west since it will not be influenced by any weakness in the subtropical ridge. It looks as though the Main Development Region or MDR is still struggling in terms of the ability for tropical cyclones to take shape. The area between Africa and the Lesser Antilles is usually fertile grounds for development this time of year but it seems that for the past several years, dry air has been the rule. The result is we see vigorous tropical waves move off of Africa, various computer models over-develop them and then nothing much happens. It’s like the models (some, not all) are simply not “aware” of the dry, more stable environment that has become a semi-permanent feature of the deep tropics. It is actually quite simple. The longer a tropical wave takes to develop, the farther west it will track. The low level easterly flow which is dominant in the tropics this time of year pushes the tropical waves generally westward. If they don’t develop at all, they often end up in the southeast Pacific and try to develop there. It’s when they don’t develop until they get past about 60 degrees west longitude that is problematic for land areas. Think about it, a larger storm or hurricane in the atmosphere will more than likely feel the effects of the mid-ocean trough that is usually waiting to allow systems to turn north and eventually northeast and away from land. Sometimes, like 2008, the subtropical ridge of high pressure is so well established that even hurricanes such as Ike can make it from Africa to Texas. Obviously this is rare – otherwise no one would want to live on the coast of Texas or anywhere else for that matter – the hurricanes would be too numerous year after year. On the other hand, a shallow tropical wave, void of deep convection or thunderstorms, can sail along with the easterly trades and gain longitude day after day. Eventually, conditions improve and a tropical depression forms. By now, the system is nearing the eastern Caribbean and it will most certainly bring squalls, heavy rain and brief high seas to the region. Hurricane Earl is an example of this scenario. The parent tropical wave struggled as it raced westward across the tropical Atlantic and in to the Caribbean Sea. It was not until it reached the western Caribbean that it developed and became a hurricane. It made landfall in Belize instead of developing early, way out in the MDR, and turning out to sea. So what does this have to do with anything currently going on in the tropics? Perhaps it has huge relevance. This is because as we watch the recent trends with 99L, we have seen some of the models delaying development until it is only a day or so away from the Caribbean Sea. This ends up sending a slowly strengthening tropical system in to the region, bringing heavy rain and other hazards to the region. Beyond that time frame, anything seems possible, including threats to the United States. Even though we expect development out in the open Atlantic, just because it doesn’t happen there doesn’t mean it won’t happen at all. The farther west these tropical waves track, the warmer the sea surface temps get. It’s only a matter of time, I believe, until we see something strengthen quickly and close to home. I just don’t know whose home yet. Bottom line – over the coming days we will see a lot of variations of the “end result” for 99L and perhaps even Fiona and soon-to-be 90L coming off Africa now. The down side to delayed development is that more people take notice when a hurricane is coming from seven to ten days out. It makes sense, the hurricane is there longer and it gets more attention and more people know about it. If it blossoms later, like Katrina did in 2005 (5 days from tropical storm to landfall) then it gives us all less time to react. The next few weeks will likely be very busy with one named storm after another forming in the Atlantic Basin. Some will be possible impact threats, others will not. It will be important to keep up with what’s going on at least daily if not more. The advantage of seeing a hurricane coming from a week out might not be there and as such, being ready in case one pops up with only 72 hours to prepare will be more important than ever. I will go over this topic in greater detail on today’s video discussion which I will post here. You can also follow along in our app, Hurricane Impact, available on the App Store. All of our blog posts and video discussions are posted to the app for easy access on the go. Plus, the app has incredible landfall features which I will talk about more when and if the time comes. We are in prime time of the hurricane season and with the Atlantic Basin as warm as it is, it comes as no surprise really that there is plenty to talk about. The NHC has several areas outlined this morning, including the remnants of TS Grace, that bear watching over the coming days. First up, TS Henri is weak and is moving quickly now to the north. The forecast calls for a turn to the northeast as it transitions from a tropical storm in to a more spread out extra-tropical system over the far reaches of the North Atlantic. Seas will begin to subside in and around Bermuda where some beach erosion took place over the past couple of days due to the constant easterly swell that Henri was generating. Henri could bring a period of heavy rain to parts of extreme southeast Newfoundland but the fast movement will limit the impact and its duration. Next we have the remnants of tropical storm Grace moving towards the northern Leeward Islands. There has been a significant increase in deep convection with the system which could lead to periods of heavy rain and gusty winds as the low pressure area moves through. While there is little chance for it to become a tropical storm again, we know by now that rain alone is enough to cause major issues if too much falls at once. The forecast indicates that the remnants will track westward towards Puerto Rico over the weekend. We’ll have to watch and see what happens once the energy gets in to the southwest Atlantic or possibly the southeast Gulf of Mexico some time next week. Off the coast of Africa is where the next large tropical wave is making its debut. The NHC is giving it a medium chance of development over the next five days and if it does in fact do so, it would be the 5th such development in the MDR or Main Development Region since late August. 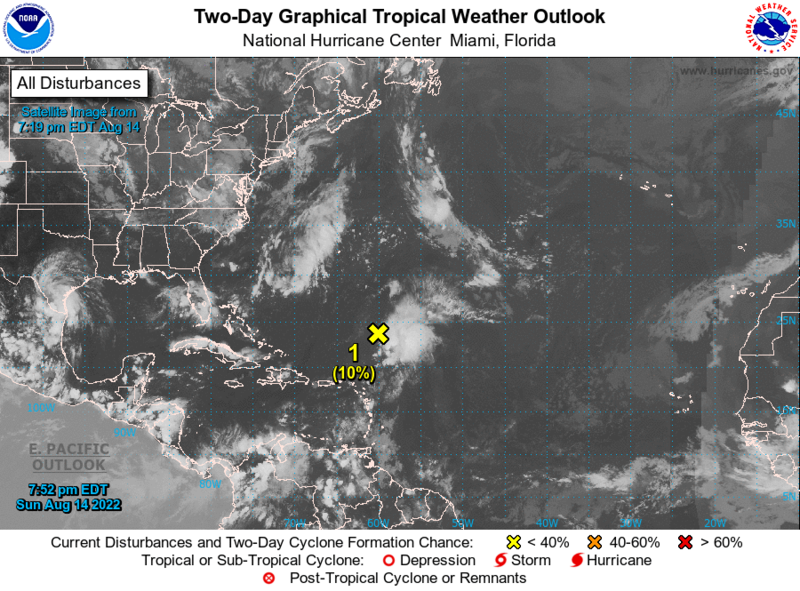 This is almost unheard of during strong El Nino seasons yet here we are, Danny, Erika, Fred and Grace all developed between Africa and the Lesser Antilles. This next system shows promise to become a hurricane over the open waters of the Atlantic in the coming days. As long as it remains away from land, so be it. Finally, a small low pressure area has developed well to the southwest of the Azores Islands in the northeast Atlantic. It has only a small opportunity for development and of course wouldn’t be an issue for any land areas; something to watch but nothing to be concerned with. To sum things up, there is plenty to keep track of but no major issues brewing in the tropics as of now. Enjoy the weekend, nice fall-like weather will be in store for much of the eastern part of the nation but then we return to the summer look and feel to things shortly, so take advantage of the cooler temps while you can! I’ll have a video discussion posted later this afternoon.